Heading into the Vermont state primaries held in August, the VPR Poll asked Vermonters about the candidates. 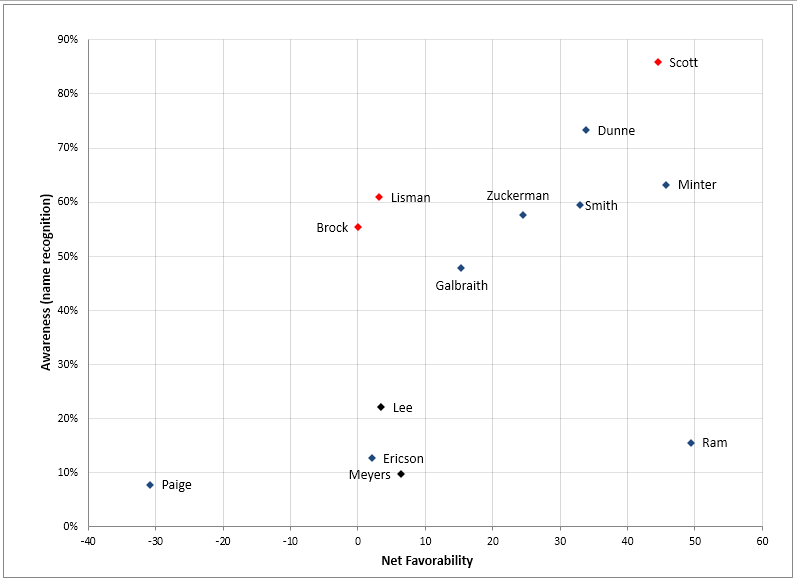 Respondents were asked if they have heard of each candidate for governor or lieutenant governor; for each candidate that a respondent has heard of, the respondents were asked if their opinion of that candidate was favorable or unfavorable. The best known candidate, by polling numbers, was Phil Scott (R), who was known to 86 percent of the general public, 73 percent of which had an opinion of Lieutenant Governor Scott. In other words, only 62 percent of the general public had an opinion on the best known of the candidates for governor. The best known Democratic candidate, Matt Dunne, is known to 73 percent of Vermont adults, 66 percent of which have an opinion of Mr. Dunne—meaning that just under half of Vermont adults (48 percent) had an opinion about Dunne. The number are lower for all other candidates, including Shap Smith (D) who has served as the Speaker of the House in the Vermont legislature. 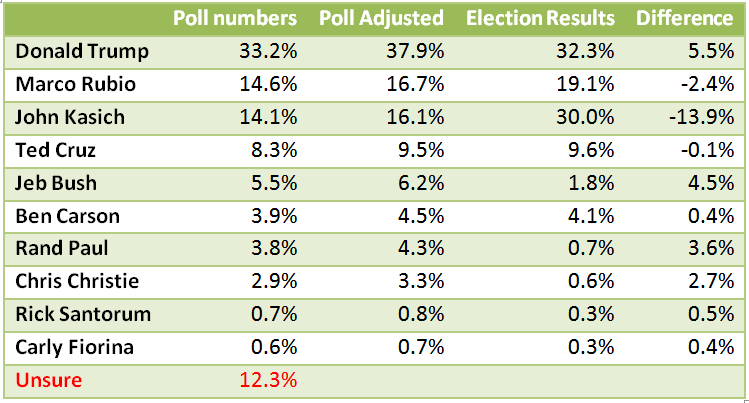 The following table shows the relative proportions of Vermont adults without opinions about the men and women running for Governor and Lieutenant Governor. Of course, there is no qualifications of knowledge about the candidates in order to vote, and it is only necessary to know about the candidate one supports. However, if elections are about choice, it would be ideal if voters knew more about the choices available to them on the ballot. Finding that a wide majority of Vermonters (74 percent) support the establishment of an ethics commission is not surprising. What’s not to support? 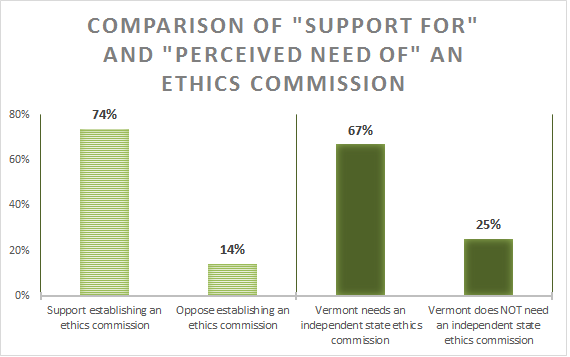 When the Castleton Poll (Sept. 2016) asked Vermonters whether they would support or oppose creating an ethics commission, there was no context about the need for or cost of creating such a body; so naturally, it is not surprising that most would support such a benign concept. 1. Right now, Vermont state government is considering whether or not to establish an independent panel to investigate potential ethics violations where state officials are involved. Would you support or oppose the establishment of a state ethics commission in Vermont? 2. Some have argued that as a small state, Vermont does not have the problems of other states, and therefore an independent ethics commission is not necessary and would only be a bother. Others have argued that Vermont needs an independent oversight body to address concerns about the ethical behavior of public officials. With whom do you most agree? We used a split-sample approach—asking a random selection of half of the panel on question and the other half the other question—to keep the concepts separated. The rationale for the split sample is that if a respondent receive both question in the order above, once someone said that they support a commission, they would likely be compelled to say that the commission was needed; if someone opposed establishing an ethics panel, they would not likely then respond that they think one is needed. Alternatively, if we reversed the order of the two, those suggesting a need for a panel would be hard pressed not to support establishing one, and vice versa. By asking all respondents only one of the two questions, we have decoupled the concepts, and by assigning the questions to respondents randomly, we have removed any bias for one question or concept over another. I believe that the most relevant statistic is the percent of Vermonters who feel that an ethics panel is needed (67 percent). Two-thirds of all those receiving the question agreed with the notion that a commission to “address concerns about the ethical behavior of public officials” is needed. While the number of Vermonters who believe an ethics commission is needed in their state is lower than the number who would support the concept of establishing a commission, it still represents a large majority. In light of the EB-5 story (http://vtdigger.org/eb5-an-investigation/) suggesting possible corruption in handling investments, it is reasonable to expect that the levels of support and the feeling that such a commission is needed have both risen (although without empirical verification, this is mere speculation on my part). Generally, it is safe to assume that calls for an ethics commission will be well-received by the Vermont public. A look at the issue by party can be found on the Polling Institute web site: http://www.castleton.edu/about-castleton/the-castleton-polling-institute/poll-results/vermont-issues-poll. On March 1st, 2016, Town Meeting Day in the Green Mountain State, Vermonters will cast their ballots in the Democratic or Republican primary races. In addition, 12 other states will make their preferences known—a total of five caucuses and nine primaries. It’s Super Tuesday, the first official date to kick off the nominating process for the parties, with exception made for the first four states. On the Republican side, 641 delegates are up from grabs on Super Tuesday, making up 26 percent of the total delegate count. For the Democrats, 907 pledged delegates will be allocated, making up 22 percent of the pledged delegates and 19 percent of the total number of delegates, pledged and unpledged. In Vermont, Senator Bernie Sanders has a lock on the Democratic side. The VPR Poll has, Sanders with 78 percent among likely Democratic primary voters (MoE +/- 5%) and Clinton with 13 percent; nine percent said they were not sure. Vermont likely Republican voters (MoE +/- 9%) favor Donald Trump (33 percent); 15 percent favor Marco Rubio, and 14 percent favor Ohio Governor John Kasich. 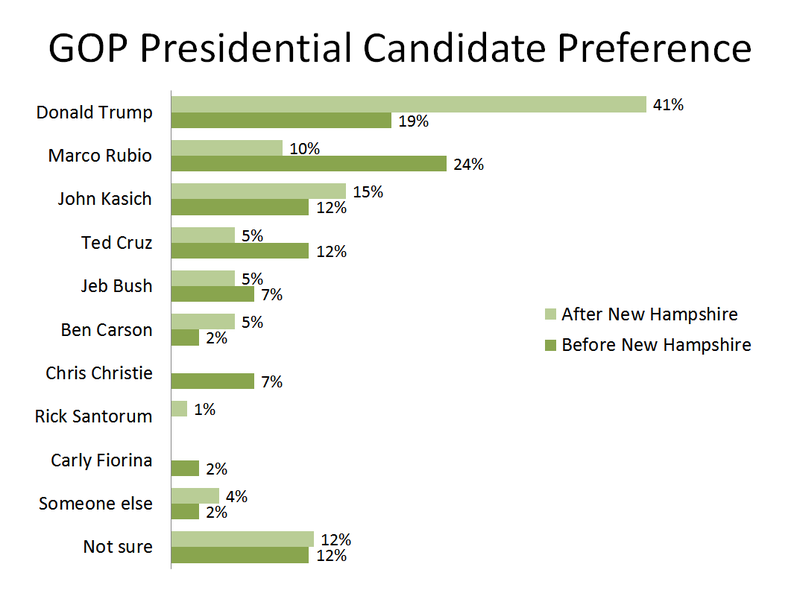 Twelve percent of likely Republican voters remained unsure. 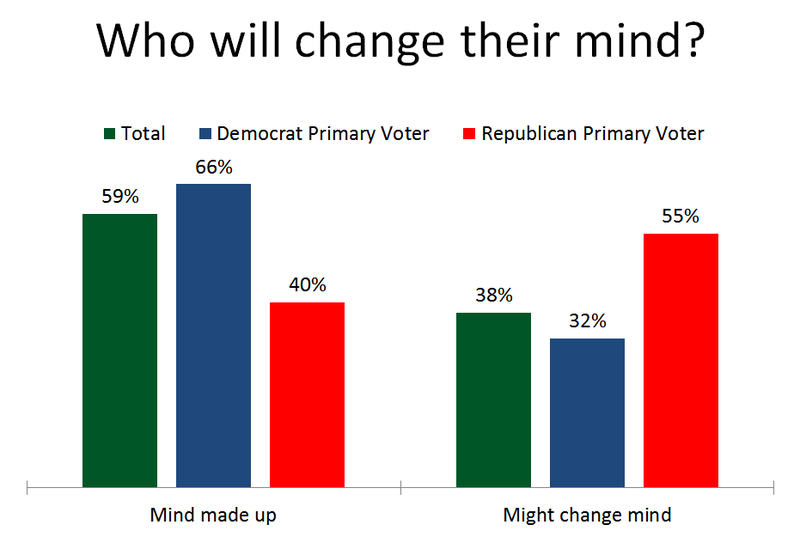 Tracking the presidential primary preferences in Vermont since the VPR Poll did not detect any change in support in either Party. While New Hampshire appeared to affect Vermonter’s preferences, there is no indication that Nevada or South Carolina have had comparable effects. Sanders’ win in New Hampshire seemed to shore up some support, but not a great deal more than he had before that primary victory. Most Sanders voters were going to support their senator no matter what happened in New Hampshire. 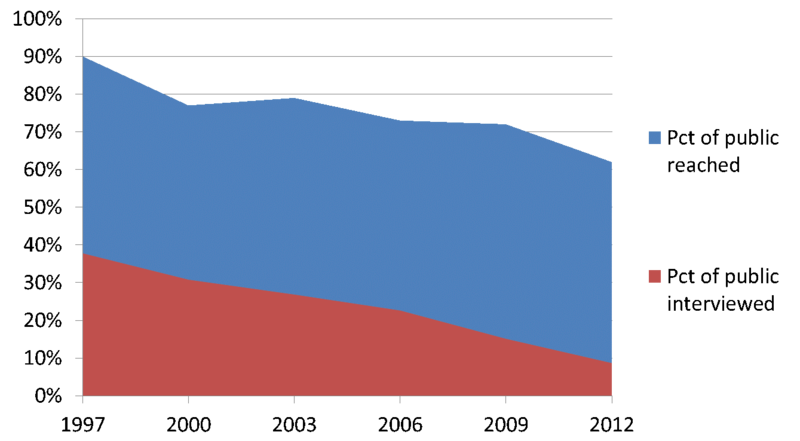 The effect of New Hampshire in the Republican side is seen in the figure below.